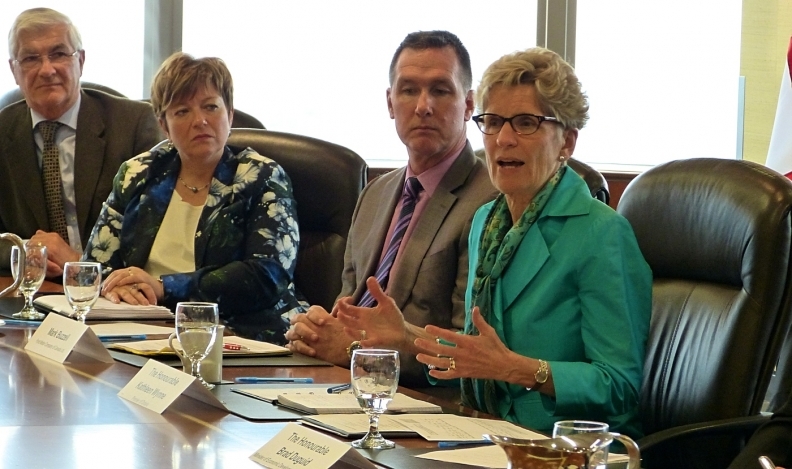 Ontario Premier Kathleen Wynne, right, has already met with several from the Canadian auto industry to talk NAFTA and trade. Now her staff is headed to Washington. The North American Free Trade Agreement will take “a front-row seat” when several premiers head to Washington next month to push back against anti-trade sentiment south of the border. Manitoba Premier Brian Pallister says he and several other provincial leaders are to spend June 5-7 in the U.S. capital, to promote the benefits of free trade. He said the trip was prompted in part by President Donald Trump's attempts to change or even scrap NAFTA. "We have to do our best to promote a better understanding south of the border of the (trade) relationship," Pallister said Thursday. "I think it demonstrates clearly to the representatives from around the United States who _ whether they are directly involved in the meetings or not _ that we value the relationship, that we consider it important and that they should too." Staff for Ontario Premier Kathleen Wynne, New Brunswick Premier Brian Gallant and Prince Edward Island's Wade MacLauchlan confirmed Thursday those leaders will attend as well. "The focus will be on trade generally, with NAFTA taking a front-row seat and 'Buy America' to a degree," read a written statement from Wynne's office. "(Wynne) would be there with her colleagues to build relationships with key members of the administration, as well as members of Congress, and to discuss the mutual benefits of an interconnected economy and the good jobs that creates for both Americans and Ontarians." Canada’s automotive sector, for example, is tightly interconnected to the United States and Mexico. The “Canadian Supply Footprint,” compiled by the Automotive Parts Manufacturers’ Association in March, shows Canadian parts makers employ about 86,000 people at 270 facilities in the United States and Mexico. Canada is trying to counter a rising tide of protectionism in the U.S. Trump has criticized NAFTA and threatened to scrap the three-country trade pact if it can't be renegotiated to his satisfaction. The federal government, which is not involved in the June mission, has mounted an information campaign aimed at Trump and his cabinet _ as well as Congress and state and local governments _ to underline the mutually beneficial trade between the countries. The Trudeau government has repeated the talking point that 35 U.S. states call Canada their top customer, while nine million Americans depend on Canada for their jobs. Pallister would not specify who the premiers plan to meet with. He said the aim is to make sure the benefits of free trade are heard well beyond states near the Canadian border. "We've already reached out to our neighbouring states and I have initial assurances that they understand the value of that (trade) relationship very well in the border states. But it's of course getting that communication across to others in the United States who may be a little less, in their area, aware of the mutual benefits of our relationship."